Good assessments play a key role in the making of an effective e-learning course. They go a long way in evaluating the learner’s ability to transfer the knowledge gained to the workplace. So, how can you evaluate your online learners effectively? What does it take to design a good e-learning assessment? Well, you need to focus on 3 important aspects. The main purpose of assessments is to measure the achievement of the learning objectives of your online course. So, align the assessment questions to the learning objectives of your e-learning course. You can use the following matrix to ensure the assessment “covers” all the learning objectives of your course. Multiple Choice Questions (MCQs) are used extensively in the assessments of e-learning courses aswell-designed MCQs go a long way They are also very useful tools to reinforce learning. You need to adhere to the following best practices when you come up with multiple choice questions for your e-learning assessment. Make sure you provide no clues to the correct answer. Often, instructional designers tend to include the options All of the above and/or None of the above, and this could help learners guess the right answer. See that distracters belong to the same family. Consider the following multiple choice question as an example.Q. Where is the headquarters of the European Central Bank (ECB) located? Here, the learner can easily identify that the last option, i.e. Italy, is not the right answer, as it does not belong to same “class” as the other options provided. Instead, it’s better to provide options that belong to the same class. Here the second option is not appropriate as liabilities are the opposite of assets. Try to ensure all options provided for a multiple choice question are of the same length. It is a best practice to provide immediate feedback to the learner after he attempts a question. Tell him why he is correct or wrong, instead of merely telling him the option chosen by him is right or wrong. You also need to make sure your feedback instills confidence in the learner and encourages him. When he gets an answer right, tell him he is correct and congratulate him. Words such as Bravo! Well done or That’s the perfect answer! can be used. On the other hand, when the learner answers a question incorrectly, you can use words such as Well tried! But, that’s not quite right, to encourage him. You can also provide him a certificate on successful completion of the course. Thus, by focusing on these three aspects, you can develop good online assessments that evaluate the learning of your people effectively. Check out oure-book Measuring Training Outcomes with Effective Online Assessments to know more about creating good e-learning assessments. 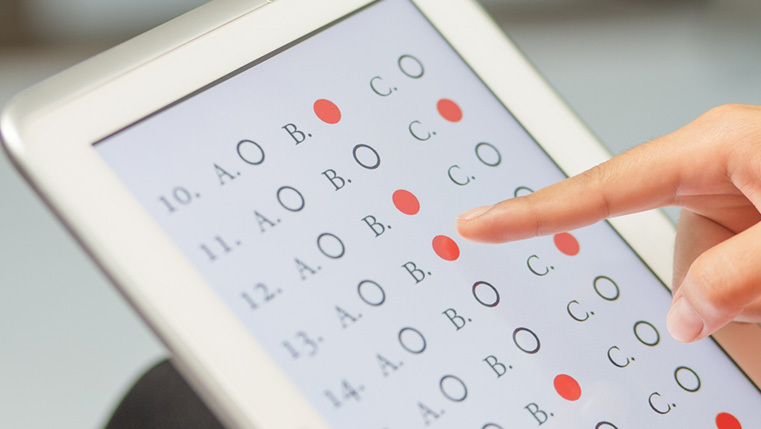 How Will Randomizing Test Questions Help You Enhance E-learning Assessments?